If you're looking for a good boat tour of the Seine river, Bateaux Parisiens is one popular and well-respected choice, attracting some 2.6 million tourists per year and offering cruise, lunch, or dinner tours with audio commentary in up to 13 languages. You can board and get off at two locations: near the foot of the Eiffel Tower or near Notre Dame Cathedral. Whether you opt for a simple cruise or for a formal lunch or dinner, the tour proffers excellent views of big-ticket Paris attractions including the the Musee d'Orsay, the Invalides, and the Louvre Museum. Overall, the basic tour gives you a glimpse of 14 monuments, 25 bridges, and four major museums, allowing you to survey some of the city's most popular attractions before deciding which to visit. 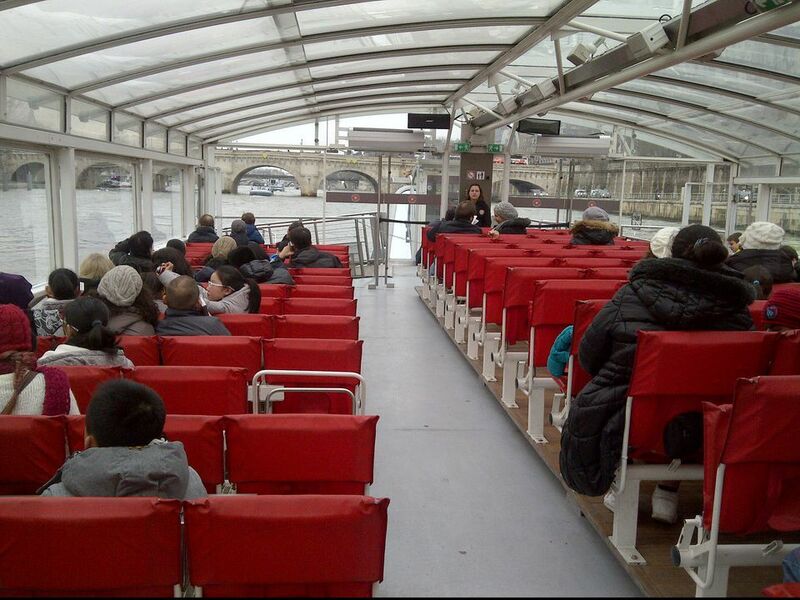 Bateaux Parisiens' fleet of 12 boats seat around 100 people for the classic cruiser and nearly 600 for the larger "trimarans", and offer panoramic views, whether you sit inside and enjoy the sights from behind the glass or grab a seat on the upper deck and take in the fresh air. Bateaux Parisiens boats (there are a total of 12 in the fleet) dock at and launch at two locations: Port de la Bourdonnais, boarding at Pier #3 (Metro Birk-Hakeim or Trocadero (line 9), and from a dock near Notre Dame Cathedral (Quai de Montebello, Metro/RER Saint-Michel). No reservations are necessary, but in peak months they are highly recommended. (You can reserve a dinner cruise package online here via Isango). You can choose between simple commented cruise tours, (one hour) or enjoy a lunch or dinner cruise (2 hours on average). Reservations are required for lunch and dinner. For a complete list of current prices, see this page. For full lunch and dinner menus and descriptions of cruise packages, see here and here. Smart dress is required for dinner cruises, but no dress code is enforced for lunch cruises. For the Eiffel Tower cruise, Bateaux Parisiens offers commentary in thirteen languages: French, English (U.K.), English (U.S.), German, Italian, Spanish, Portuguese, Russian, Polish, Dutch, Chinese, Japanese, and Korean. For the Notre Dame cruise, only four languages are available: French, English, Spanish, and German. Individual audio headsets are provided free of charge with a ticket for the basic cruise, but you can choose to enjoy the cruise without commentary if you prefer. Eiffel Tower Departures: Boats leave every 30 minutes between 10:00 am and 10:30 pm (April-September); once per hour from 10:30 am to 10:00 pm (October-March). Weekends and weekdays during French «Zone C» school holidays: 10:30 am to 10:00 pm. Notre Dame Departures: Visit timetable at this page. What Will You'll See on the Tour? For a preview of the sights and attractions you'll see on the tour, visit the photo gallery by clicking the link at the bottom of this page.